Cades Cove is the most popular destination in the Great Smoky Mountains National Park. Along its 11 mile motor nature trail you’ll become immersed in Appalachian history and its natural beauty. It’s easy to spend all day exploring the Cades Cove loop, but there are some stops you absolutely have to make sure that you make along the way! John and Lurany were some of the first settlers to the Cades Cove area. The Oliver Cabin is a neat architectural structure. The cabin is held together by notches in the wood and by its own weight! There are no nails or pegs keeping it together. This is the first structure you will pass along the loop, and a must see! The Primitive Baptist Church was built in 1887. It was built because of a split in the Baptist church congregation over a particular Bible interpretation. You can actually go inside and explore this church, and even sit in the pews to imagine what life was like back then. There are two other churches you can explore as well the Methodist Church and the Missionary Baptist Church. The Cable Grist Mill is the only working grist mill in the Great Smoky Mountains National Park. You can get great pictures of the waterwheel actually turning here. Moreover, you can also explore a homestead, a barn, a smokehouse, and blacksmith shop here! The Cable Mill is located near the Cades Cove Visitor Center. The visitor center is a great place to buy a souvenir or learn more history about Cades Cove. The Cable Mill offers a lot to explore along the Cades Cove loop! Henry Whitehead’s cabin was considered very special at the time is was built. Not only is it a genuine log cabin, but it also has a fully built brick chimney! At the time, bricks had to be made by hand and it was a long process. The Tipton Place is special because the home is two stories! Miss Lucy and Miss Lizzie Tipton lived in the home and were school teachers in Cades Cove. Right near the homestead is the cantilever barn which absolutely deserves a visit will you are at the Tipton Place as well! Only a third of the entire barn actually touches the ground! It’s considered a genius architectural design. Don’t forget to keep your eyes open to look for native wildlife along the Cades Cove loop! You can often spot deer and even black bears! 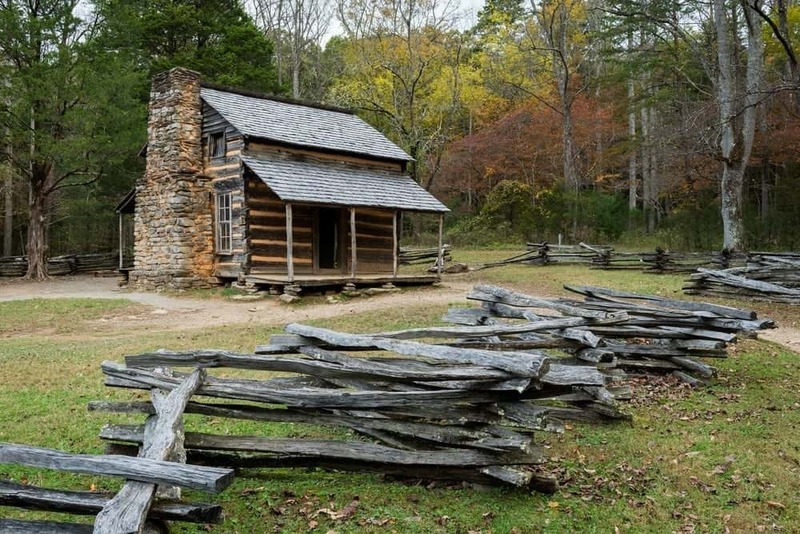 If you love learning about history in the Great Smoky Mountains check out the other historical sites in the Smokies you have to make time for to visit!